Great Britain under-23 men?s coach Rod Ellingworth is convinced that the team can repeat their bronze medal in the 2007 road race. Last year, Jonny Bellis (pictured above) finished third in the sprint in Stuttgart and Ellingworth is confident the five-man team can do just as well on the tougher Varese course after a hugely successful season in Italy. ?We?re going into the race as a top ten nation that can win it,? he told Cycling Weekly. ?A top ten would be really good again because it means you?re in the race. We know we can get a top ten, Jonny Bellis, Ben Swift and Pete Kennaugh are all good enough to get a top ten. If we don?t get it, it?ll be because something happened and they were unlucky.? Ellingworth revealed that Jonathan McEvoy has been ill but will ride, while Pete Kennaugh crashed on Tuesday but is fine. ?Jonny isn?t very well and was ill on Wednesday night. He did his last training ride but was suffering. We?ve pushed him a lot recently but he?ll give his best and it?s his last race of the season, so I?m sure he?ll do a good job for the team,? Ellingworth said. ?All the others look pretty good. 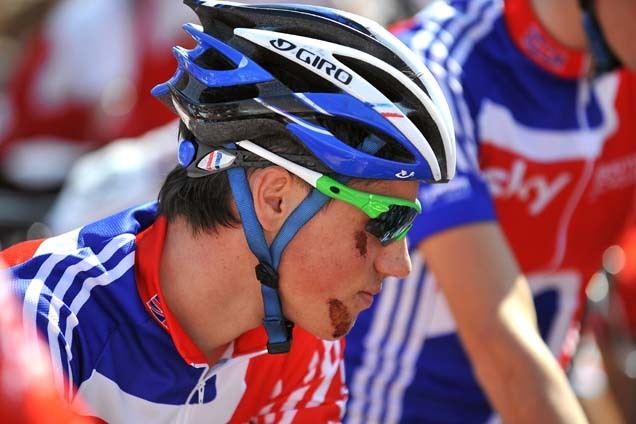 Pete Kennaugh crashed in training on Tuesday when it was raining and took all the skin off his face. He was lucky but he?s okay.? Ellingworth revealed the Great Britain strategy for the 173km race. ?Our objective is to have all three of them up there in the finale of the race in the last 50km. The other guys are there to help them out with whatever they need. honest about how they feel. ?They?ve looked at the course in detail and they know it?s going to be a tough race. The advantage is that they?re used to the Italian roads and have been racing together at the highest level all year. ?